We at golfclub-technology have been building Tom Wishon golf clubs since 2001. Tom Wishon began designing custom clubmaking components in 1985. Since then, he has designed more original clubhead models in more different areas of materials and production processes than any other designer in the history of the game. He remains the only designer in the component clubmaking industry to have created clubhead models which have been used to win on the PGA Tour and the Ryder Cup. Tom Wishon Golf Technology is recognized by professional clubmakers as the highest quality designers of high performance original clubheads, shafts, grips and fitting technology products used by independent professional clubmakers around the world to build custom fit golf clubs for discriminating golfers. Tom Wishon Golf Technology stands alone in the custom clubmaking industry as the ONLY company that designs all of its own original clubhead, shaft and grip models. Having begun his career in clubmaking in 1972, Tom has worked exclusively since 1980 to develop a truly “high-end” segment within the component clubmaking industry. In 2001, tired of the emphasis on sales and profit, Tom left the corporate side of the golf equipment industry to move back to his home state of Colorado to build his own company committed only to developing the highest quality designs, backed by the best technical research in the game. From the thousands of hours of research he has performed over the course of his career, Tom Wishon has established himself as the leading authority on clubmaking and clubfitting technology in the golf equipment industry. 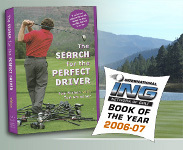 He is the author of numerous books on different technical areas within clubmaking, and has written hundreds of equipment related articles for virtually every golf publication in the industry. Tom is the only designer from the clubmaking component segment of the golf industry whose clubhead designs have won on the PGA Tour and been played in Ryder Cup competition. He has designed and custom built the golf clubs used in competition by Scott Verplank, Bruce Lietzke, Ben Crenshaw, as well as the last set of clubs played by Payne Stewart before his tragic departure from the game in 1999. The topics cover everything from "Custom Fit vs. Standard", "What does Custom Fitting do for the Golfer", "Basic Shaft Fitting",thru to "The Facts of Life about the Golf Equipment Industry"
Spend some time viewing these videos and have your eyes opened.